Lots of you asked about the sticky tool I used yesterday to pick up the small pieces. That is my scrapping best friend when it comes to those small Cricut pieces. It's called a QuicStik by QuicKutz. Besides ordering right from QuicKutz, I know you can buy it at Hobby Lobby and you can also find it on Amazon. If you google search it you'll find a few other online stores that carry it as well. wow, you ordered the E2! I'm watching it from the DVR. Not sure that I NEED it (need is not important, right?) I did order Elegant Edges tho - couldn't find that cart from NY to VA on a recent road trip. I'm excited for you. Now to watch your video on another cart I don't own. Stay awake today! Well I guess we all craft aholics were doing the same thing last night. I did stay up for the whole thing but did not order it. This morning I was making coffee for my husband and at 6am ordered it. LOl. I could not resist. I love the features and the color will go great in my room. I hope it is not a disappointment like the gypsy. That is a machine that I regret purchasing. ALso ordered the imagine and returned it within 30 days. Was not fond of it. Hopefully the E2 will not go back. Can't wait to see your video on it. I love this cut, yeah now can't wait to see video's on the E2, I did order one too but it will be here next week. Guess I can wait. You are so talented? You make it seem so smooth and easy. Thanks for doing this for all of us watchers. Have fun with you E2. I'm holding out for the Imagine. Loved the card you made yesterday and made one, too! This one is just as adorable. I'm enjoying your series as always! I ordered the E2 at 12:30 AM. It's a little pricey but the things it can do! I plan on keeping my original Expression and using both. 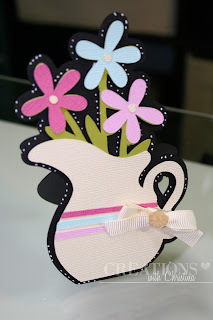 I like the shaped card without the Gypsy (love mine, though)and this one is so cute. What a wonderful get well card, thinking of you, birth day, etc. Thanks for the inspiration. I'm with you friend! I fell asleep at midnight and woke up at 3:20...been up since. I do this on a regular basis. It's killing me! Love this pitcher card going to try it just in time for mothers day thanks. Love your videos Christina! This card is adorable and I love your color pallet. I as well ordered the E2 this morning around 4:00am. I wasn't going to, but after watching the show, I fell for the awesome features. Love the Cricut! I will be keeping all my others this is just a new roommate. LOL Others you say yes three. Very cool. I really like this idea. Thanks!! Christin C.
Thank you for the video. I'm always wishing I could make shaped cards out of something but don't have a Gypsy to do it with. I have Design Studio, but I'm not very good with it. I'm loving this series. I don't have Gypsy or DS so really am glad you showed how to make the shaped card without them. I'm really envious of your new purchase, but am glad you could get it. Just can't justify buying another Expression. Watched the E2 last night but my E was ordered last April and just couldn't justify the new one but I would like to own the E2. Would you tell us where we can get the destress tool and the name for it also. I went to Michaels and Beverlys yesterday and could not find the QuickStik or the destress tool. My hubby's b'day today or I would be making this cute card. I hope you get your 2nd wind and make it just fine through the day. My dear next door neighbor ordered an E2. She is a doll so I am happy for her I'll just go next door and feel my heart start speed racing when I see hers. Hope you managed to stay awake today. What a trooper you are in the name of crafting. feel like we're doing something creative ... even if we're not. Thanks for being so sweet! Hi to Ethan and the DH! Yet another video I enjoyed! Such a cute card...I may have to get this cartridge once I can afford it....like you I ordered the E2 so buying it right now isn't possible! I'll add it to my list though. Love this card! I just purchased this cartridge last weekend so I'm really glad to see this series. Congrats on your CE2! I purchased one this afternoon and I can't wait till it gets here. Another really cute card. Love it. I stayed up and watched but didn't buy. Money is tight right now. I have a gypsy and really do like it so I can do just about all the same things. Not all but most. This is a very beautiful card! TFS! It amazes me how you envision such beautiful projects when you look at your carts. I really wished I had your vision and talent. I keep following you hoping that some of your talent will eventually rub off onto me. What a perfect Mother's Day card! Thanks for the idea! I don't have Gypsy or DS so really am glad you showed how to make the shaped card without them. I know what you mean about the toothpicks in the eyes but my sleep was disrupted by the storms with tornado sirens that were going on. Two nights in a row that it has stormed all night. Thanks for the instucktions on makeing a shaped card without DS or a G. These will come in handy. I don't know how I missed your cute little vase of flowers video yesterday. I have this cartridge and will have to make this. Thanks for the ideas. Thanks I have a gyspy but tried it this way with a different cartridge and it turned out adorable. Cute card ! I love your clever ideas! Have fun with your new CE2 !